Here at Highlands, we have loved using this program called DaVinci Resolve to color correct all of our footage! It is a very high quality program that is used to color major motion pictures as well as commercial spots and lots of other things. They offer a free version that we used for while and does pretty much everything you need. I did a screen capture of me coloring a shot in one of our weekly news videos. Enjoy! We frequently Periscope as a team, often to discuss a new project we’re doing or technique we’re using (follow us @cothcreative! ), and last week, we Scoped from the set of Highlands News to give people a behind-the-scenes look at our shoot. During the broadcast, we had a time of Q&A, and one of the viewers asked for advice in helping on-screen talent appear energetic and friendly while using a teleprompter. It’s a great question, because it’s harder than it looks and often leaves talent frustrated as they try to juggle information, inflection, energy, facial expressions and reading – while trying to look like they’re not actually reading. It’s not a task for the faint of heart! - Think about the person behind the camera. No, not the shooter, I mean the person you’re talking to on Sunday. What are they thinking, feeling? How can you make them feel more welcome and at home? Use that mentality when sharing the information in the script. Look through the teleprompter and picture that person’s face. - Go “up” at the end of your lines. Human nature is to lower your volume, pitch and tone at the end of each sentence. On screen, it translates with really low energy, so be sure to keep your pitch and volume level the same or bring it slightly higher at the end to keep your lines nice and bright. - Keep your eyes open. Almost wider than you think is necessary. A lot of people squint when they read, and squinting will keep people from connecting with you. Like they say, the eyes are the window to the soul. Your want people to connect with you! - Smile while you talk. This isn’t exactly natural, unless you’re talking about something funny, so practice in front of a mirror. What do you look like when you smile like “this” or “that”? It’s important to know (away from the mirror) what your face looks like when you move it a certain way. Practice makes perfect. Also, vid teams, help your talent out by writing a friendly, conversational script. It’s a lot easier to appear friendly and conversational when the script is written that way! For reference, practice saying the script aloud as you write it. And never address your audience as a group. Any time you can refer to the viewer in the singular, do it. For example, Never say "Hey Church!" say something like "Thank YOU for joining us." Hope this helps! Happy news-ing, everyone! I've also really loved using two songs off of Taylor Swift's album, Red. There's a legit instrumental version here. Also, if there's a song that you really think would work well in your news, chances are there is a decent karaoke version on iTunes. Type in the name of the song you are looking for and put the word "karaoke" on the end of your search and start previewing away! We have done this a couple of times with good results. For more info about music for video, check out this blog post. Hope this helps you and your church! Feel free to ask any questions in the comments section below! Every year we do a series called "At The Movies." And it's huge and epic and crazy and everyone loves it and lots of other churches do it and it's just really fun. That being said we thought we would give away some of the shots we used to make the opener. Specifically the projector and its sfx. We got a 16mm Eiki projector that looks like its from the 70s, brought it in the studio, and shot some nice broll of it. Hazed it up, and used a sock with baby powder in it to create those particles. Just smack it a few times before a shot, the sock that is...not the projector. We took the Broll of that projector and cut it up with reverse shots of actual movies being projected on the wall (2013) or in an actual movie theater (2014). We can't give those to you for obvious reasons, but basically what we did was get a bunch of clips from famous movies, put a lot of noise on them to look old and then projected them using a much more modern and HD projector. Then we took a slider and some handheld shots of them. In 2013 we shot it in our little studio and to get the feel that it was in a theater we just grabbed a few office chairs because their silhouettes are close enough. Then in 2014 we actually got into a local theater and that was awesome too. Take a look at the openers below and download the footage below that. It's a bit big(1.6gb) but its 15 decently long clips. And if you use it then send us a link! Here is 2013. Pretty small shoot for one of my favorite openers. You don't need to credit us with these shots, but please don't sell them anywhere. Also if you do use them somewhere we would love to see it! Feel free to post a link of your work in the comments below. Sometimes the shot you want has "stuff" in the way. 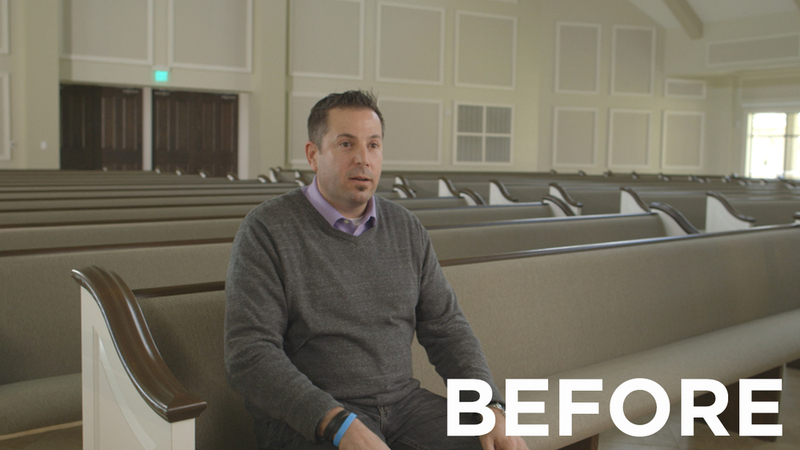 Maybe you're setting up a testimony and in order to get good boom mic placement you have to sacrifice your wide shot. Or maybe your arms get a little tired and you drop the boom pole into the shot. Or maybe there is a bright "EXIT" sign in the back of the room. There are tons of reasons why your shot could become cluttered and ultimately unusable. But there is a simple fix to all of this and all it requires is a little forethought and a few minutes in After Effects. Take a look at some examples below, sorry they aren't color corrected. As you can see we took a lot out of those images, we removed anything and everything that was distracting to the eye and that didn't add to the overall beauty of the shot. And since the room is a very large room that is hard to haze we even added in some fake light rays. Its easier than you'd imagine. 1. Plan your shot accordingly. When you're setting up your shot make sure nothing you're planning on taking out is "touching" your talent. Don't let an exit sign creep out from behind their head and don't let a chimera or light stand be behind them in your lens. If it's in a corner of the shot or over their head then you're good! Trust me you don't want to find yourself rotoscoping their every move later. You will kick yourself during the edit. But if your subject is one who moves around a lot you may find yourself doing it anyway. 2. Get a clean plate and don't touch the camera! Either before your subject gets into the shot or after you've gotten everything, you need to get a clean shot of the scene without the subject and without the gear. DO NOT TOUCH the camera between filming your subject and getting the plate, even the slightest movement could mess up your shot and hurt you in post. However, if you do shift it a little don't freak out cause you'll still be able to fix it in post but it'll just take longer and be more frustrating. You'll need to get at least 15 seconds if not a minute or two of the clean plate. You need video and not a photo because you want the natural noise of the camera so that it doesn't look jarring on your screen. You're basically going to just duplicate the plate and spread it out over the length of your edit. The plate has nothing in it, its just your scene. No gear, no people. 3. Drop both of them in AE and get to work! So with the above example it is incredibly easy to fix this in AE. Just drop that clean slate on top and add a simple mask with a little feather. You might also have to play with the brightness because you probably did have lights on in the first shot. It's still easy to fix, but you have to spend a little more time on it. There is two different tools to use here. One is the Clone stamp tool, similar to Photoshop's, and the other is replicating part of your scene. What is nice about this is that you don't actually need a clean plate of the scene you can just duplicate your current one. However, I would still get one just in case. Duplicate your footage, and then double click its layer in the timeline panel. You should then be in the "Layer View" which is the second tab of your Preview Window in AE. Make sure your playhead is at the very first frame when you do this. From here grab your clone tool, the little stamp in your tools, and play with the brush size until you get exactly what you need. Then alt-click on the part of the footage you want to sample. Release the alt key and then start brushing. Its a good idea to sample several different areas around the area you're removing so that you can get a good mix of the correct colors and it wont look like a smudge on the footage. Once you're done click back over to your composition panel, the first tab in the Preview Window, and then ram preview to make sure it looks correct. Different than the clone tool but achieves the same result. Duplicate your footage, and then draw a mask around an area in your footage that is similar to the area you're trying to correct. For this example we are wanting to cover the sound booth with a panel that matches the other sound panels on the wall. You can see we actually used another panel and just shifted the position to cover the sound booth. Draw a mask around the area you want to sample and then drag it over and align it. The perspective may be off a bit but you can fix that with a warp or by making the layer 3d and rotating it on the x or y axis. We actually used several other parts of the scene to cover these ugly blemishes. Sometimes it will look great on the first try and others it will take some serious tweaking. The only effects that might be helpful here is "Hue/Saturation" to shift the hue slightly, "Tint" to force the color to match that which it is replacing, and then "Brightness/Contrast" to adjust any changes in light between the two samples. That's it! You're done! Now, while it renders, go celebrate! Hopefully this short and easy tutorial will help you when you've come into a jam and need to remove that pesky boom pole that keeps dropping in or when you are planning out your shots for an interview style video. One more thing, if you are needing to do this on a moving shot there is a solution. It involves camera tracking and attaching the composite layers (Clone tool and replications) to the track or some other more complicated methods. Here is an old tutorial that still works and here is another tutorial that looks very promising. We'd love to see your work if you end up using this method so feel free to post links below and ask questions! I’m pretty sure the average person couldn’t tell you why they love Facebook, Twitter and Instagram – and they may be reluctant to admit it – but they do, in fact, love it – so much that they can’t seem to stay away from it. Social media is not addictive on a case-by-case basis; almost everyone experiences its magnetic pull. But why? Why is it so difficult to tear our eyes away from the endless stream of photos of sandy beach feet, Starbucks cups, motivational quotes, Throw Back Thursdays, song lyrics, and yesterday’s dinner? There is a lot of interesting research out there about the scientific reasons for “social media addiction” (i.e. how each post provides a surge of dopamine to our brains), but it all boils down to this: People love social media because it’s “social.” We are living in what Seth Godin calls a “Connection Economy,” where it seems the world is finally waking up to the inherent desire and need for relationship that God placed in us from the very beginning, and people are starting to turn their minds off to anything that does not have a potentially “social” aspect. Thus, impersonal advertising and marketing techniques like billboards and TV ads are losing ground in engagement and, consequently, lucrativeness. The world has abandoned the monologue advertisement of faceless, corporate organizations and turned to social media to find connection and be heard. While there may be a negative grumble resounding around the fact that the world is fixated on social media, it presents an unprecedented opportunity for companies (and churches!) to interact with their customers (or attendees/members) 24/7, which not only provides an endless stream of helpful feedback, but also creates an opportunity to build relationships, meet needs, and, ultimately, care for people. And that’s what we, as The Church, are all about. We care for people. Social media gives us an ability to hear every voice – and reach a lot of people with the love of Jesus! – if we go about it the right way. Graphics (e.g. your event logo with service times overlaid on top or even a photo with overlaid event info) are the Ghost of Marketing Past; they are old school, and they are hurting you more than they’re helping you. People are not only disengaged from social media graphics due to their lack of cultural relevance, but they are frustrated that anyone would be so rude as to interrupt their delightful, photographically-issued dopamine experience with a bombardment of unsolicited words, text and information. Instead of defaulting to an informational graphic, post a crisp, engaging photo of the event or cause you’re promoting (preferably picturing people enjoying said event!) with a punchy caption that will get across the same exact information you would have communicated through a graphic. (Examples: NewSpring, Elevation, Highlands). This allows people to keep their brains happy media-wise while also connecting with you, your event, and your church’s personality. As you gain their trust over time by allowing them to get to know you as a church through photographical windows, they may eventually give one of your events a shot. Nobody really wants to be sold anything, and this is the beauty of The Church becoming properly active on social media: We’re not selling anything. We’re trying to connect people with others (which is what they want) and with Jesus (which is what they need). Our goals with social media need to be centered on building relationships, meeting needs, caring for people, and connecting them with the personality of our churches. The more authentically we can do this, the more effective we will be in communicating the love of God to this connection-driven world. Let's make our posts count. Now that you've begun to view fonts in a new light, it is time to dig a little deeper. If you have yet to read the first typography post I highly recommend you give it a peek. It’s all about seeing past the words themselves and appreciating individual letterforms as harmonious and intricately formed shapes. Now that we’ve gotten that out of the way let’s talk about some basic principles. Having a good foundation early on enables you to break the rules and get away with it. Odd’s are you have probably heard the word “copy,” or the process of “copy-writing.” Copy writing is challenging and It takes a special kind of person to do it well. It’s basically the content or words that you (as the designer) are given to work with. In a menu it is everything from the item names, to the descriptions of said items. It could also be the “about us” paragraph on your church’s website. It is a broad term. So why am I talking about this? Basically it is the engine to your car. The hot air to your balloon. The beating heart to your project. Without it we become artist’s and not designers. There is indeed a difference. Art's communication is heavily dependent on what the viewer wants it to say, while design should communicate exactly what we (creatives) want it to say. The vehicle for that communication? Copy. Yes, there is a large degree of art to what we do, but that is a different discussion. Now back to copy. At Highlands, the words we print and post are mulled over and read on multiple levels. This insures the highest probability of communicating correctly what we want to say. That word “correctly” is key. Here is an example of the communication process: Our staff small groups team, drafts the vision and passes that along to our art director. Our art director then works with the team to write something that communicates that vision in the best way possible. Once approved, the language is read by several others to hammer out any kinks or things that might be confusing. It is important to get as many eyes on your copy as possible. The last thing you want is to send out the wrong date or have an embarrassing mispeling. Once the copy is finalized, it is then passed down to us (the designers). This is where the fun begins. Most likely it is either too much to handle or not enough. It never is perfect. If it was the perfect amount of copy the first time I think you and I would be out of a job. Let’s face it, that is what we are for. We are problem solvers. So time to solve some problems. I would venture to say that 80 percent of length issues can be resolved by a revision. But there are going to be those times when you just have to make it work. Let’s talk about what to do. For simplicity’s sake I am going to talk about print pieces. Web is a whole separate gambit and frankly needs to come from a different brain. Let’s talk about that mailer your pastor asked you for the end of summer. Mailers are great. Everyone loves mailers. It is time for the church to have some good mailers don't you think? Expect a blog post about mailers soon. Most church mailers have this in common. There is usually a large block of text describing something. That’s what we should focus on. But first lets have a vocabulary lesson. Alignment: The setting of text flow or image placement relative to a page, column (measure), table cell or tab. Point size: The smallest whole unit of measure in typography. Leading: The distance between the baselines of successive lines of type. Baseline: The line upon which most letters "sit" and below which descenders extend. Widow: A paragraph-ending line that falls at the beginning of the following page or column, thus separated from the rest of the text. Orphan: A paragraph-opening line that appears by itself at the bottom of a page or column. And a word, part of a word, or very short line that appears by itself at the end of a paragraph. Orphans result in too much white space between paragraphs or at the bottom of a page. Do not worry about remembering the difference between orphans and widows. Just remember that they are both bad. White-space: The area you think is missing something but is adding everything. Let’s break typesetting copy down in order of the terms listed about. Alignment should be one of the first choices you make. You have several options here. Left, centered, right, justified are the main ones. It depends wholly on the volume that you are trying to communicate. Center aligning a slew of text ends up being uncomfortable to read. You do want people to read what your saying right? Most people look for an excuse not to read it. Especially in this digital media oriented age. You should make it as comfortable as possible. Save your spice for the headlines. Focus on being precise. Don’t excuse lack of flare for lack of attention when it comes to copy typesetting. If you center align your body of text it loses that solid line the readers eye uses to orient itself. Center justify small amounts of text. This same concept applies to right aligned text. You are better off left aligning or justifying your text. Left aligning is the safest option. The problem you face when fully justifying your text is “rivers.” Rivers are distorted spaces between your words. Not very pretty right? You fix this by using hyphens. In most cases you want to refrain from using hyphens cause they are not the most attractive looking marks. They work well with large amounts of copy but so much with very little amounts of copy. Now that you have your alignment adjusted, focus on your point size. Your point size is determined by the size of your print piece. If it is a billboard it is going to be pretty large. That is different than lets say a business card. For mailers the smallest size you should set your copy in is typically around 9pt. If you are using a font with a large x-height you are probably okay to use an 8pt. Just like your document size determines your point-size, the culmination of your document size and point-size determines your leading amount. Leading can get a little hairy. Most programs will determine this for you. Adobe does a good job at calculating a figure based off of your point size but it’s normally a weird number. In design school I was taught to use whole numbers as much as possible. Why not? If you leave this post remembering one thing, remember this. Do not compensate for a lack of copy with increased font and leading size. You are hurting yourself. Revel in that white space. Avoid large bodies of text in all caps. If everything is important nothing is important. Maintain consistency. Instead of using a completely different font mid paragraph to emphasize a thought, try using a different weight and/or color. Copy and paste. Copy and paste EVERYTHING. It is the saving grace of graphic designers. Most of us can not spel anywaay. Read your copy. Read the first few lines and see if the amount of words per line is comfortable to read. As we were searching for inspiration for how to promote our Easter services via social media, I came across Saddleback's 2014 Easter package. Learn how we used our own shareable images to let our followers promote Easter across social media. Watch all the video elements for Easter 2015 here at Highlands. This months friday freebie involves a hipster, rain, and an all around bad day. If you need some emotive slow motion broll for your next project then this post is for you. Have you ever felt overdressed for a party or even perhaps a date? Or what about feeling underdressed for a job interview or meeting that you thought was going to be casual but was actually strictly business? The horror. Most of us have, and it can be a little awkward at times. Of course, you'll get through it, but you're still left feeling a little out of place. That same principle applies to typography. Understanding how to properly use typefaces can make the difference between your designs looking good and your designs looking great. Sometimes the most complicated part about learning to edit video is knowing what settings to use while exporting. What codec should I use? What container? Bitrate? Frame rate? In this post, I'm going to cover how we export video to play in our church services on Sunday mornings. We are on the last leg of a crazy busy season here at highlands. We went from At The Movies, straight into Christmas services, 21 Days of Prayer, and Financial Freedom conference, then into two new series, the Dream Team party and then Ignite. We've got Catalyst and Easter coming up but we have a few weeks to catch our breath and collect our ideas before we crack down and start the grind again. While this season is busy we love it! We get to make some of our best content during these fast paced and high pressure times. The Creative Team at Highlands is in search of a video producer! This position is for the person who loves video. Sometimes after we’ve filmed a video we realize we’ve missed something or we need one more shot to really tell the story. And sometimes that’s after a huge shoot with lots of moving pieces and scheduling, like horses, armor and a crazy location. So you cant really just pack everything up and head back out to shoot. Sometimes you have to fake a shot and sometimes all you have to use is construction paper.